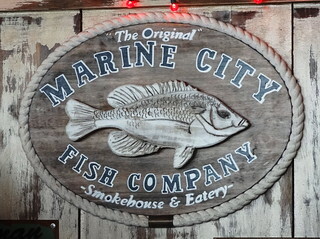 If you haven’t been to Marine City in a while (or ever) you need to put it on your list of places to visit. This quaint city along the west bank of the St. Clair River has a newly vibrant downtown that includes restaurants, boutiques, antique shops, waterfront parks, a public beach and two live theatres. There’s even a car Ferry that will take you across the river to Sombra, Ontario Canada. Roughly 50 miles northeast of Detroit it’s perfect for a quick escape from the hustle and bustle of the city. Today we are seeing a matinée performance of Roald Dahl’s Willy Wonka at the River Bank Theatre, first we’re having lunch at the Marine City Fish Company. We arrive before the theatre rush; the eatery specializes in local fresh fish, house made pasta, house-smoked ribs and smoked salmon. 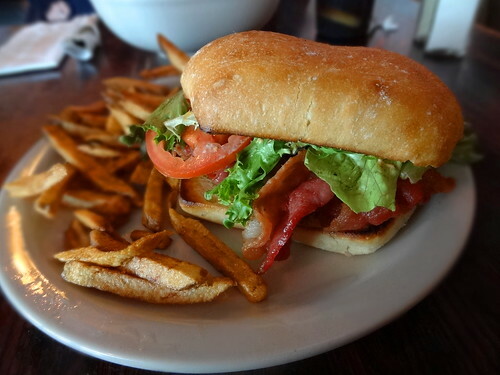 We’ve selected the BLT: house-smoked brown sugar bacon, white cheddar, tomato, greens and creole mayo on a grilled french roll. The bacon is crisp, the brown sugar and creole seasoning work well together, yum. 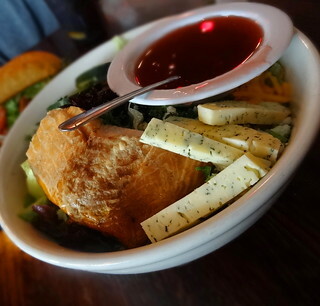 The smoked salmon salad starts with a generous portion of baby greens, onion, tomato, cucumber, gourmet cheeses and of course, the house-smoked salmon; the cherry vinaigrette is a nice touch. When we’re finished I notice there isn’t an empty seat in the place. There’s still time before the show, let’s go get dessert. 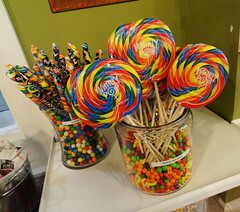 The Sweet Tooth moved into its new location earlier this year, the larger space allows the chocolates to be made on-site and includes a rentable room for parties. The man behind the chocolate is Marine City’s own Candy Man, Todd May. 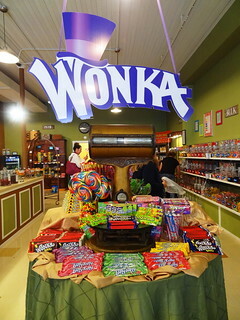 Todd has transformed the shop into a Wonka wonderland! 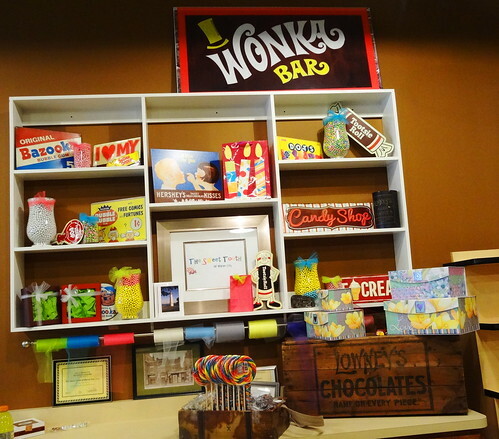 Candy bars wear Wonka labels straight out of the movie, other Wonka candy varieties are nestled together on a table display. 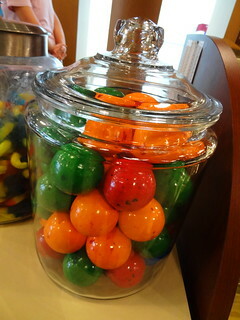 Whirly Pops and Unicorn Horn suckers are a rainbow of colors, big glass jars hold jaw breakers, suckers and gumballs. 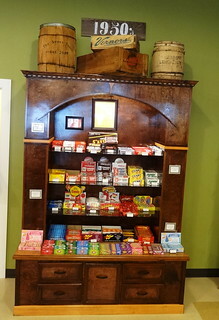 Big wooden cases display vintage candy signs and retro candy from the 50’s-70’s. 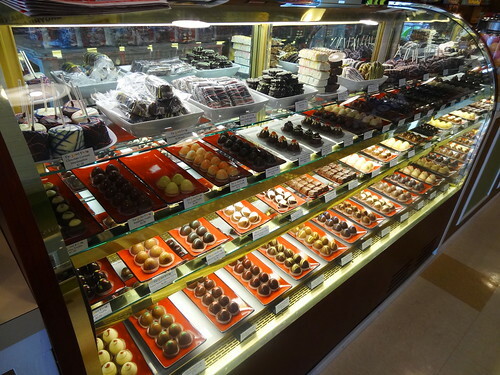 On the left side of the shop glass cases display handmade chocolates from truffles, barks and clusters to turtles, toffee and pretzels dipped and sprinkled a half-dozen different ways; a dazzling array of bulk bins line the other wall. The Sweet Tooth also sells Michigan’s own Hudsonville Ice Cream, that’s what I’m having, if I can just decide which flavor….. In the meantime Kris decides on toffee and a chocolate dipped Nutter Butter, I order a scoop of Sleeping Bear Dunes Bear Hug in a cup, best decision I’ve made today. Deep chocolate ice cream, thick caramel swirl and chocolate covered cashews, delicious. When we’ve finished we walk down Water Street three doors to the River Bank Theatre. 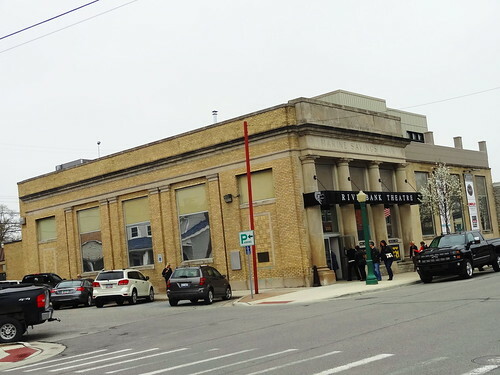 Originally the Marine Savings Bank, the brick and stone building was constructed in the early 1900’s. 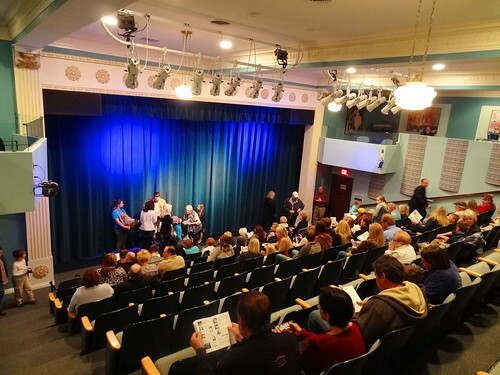 The structure was converted to a theatre seating 179 patrons with tiered and box seating; the vaults and architectural details remain, love that. Wonka has taken over the theatre, framed posters of lickable wallpaper hang in the lobby. 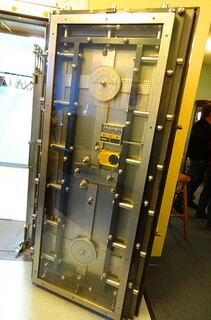 Bank vaults are visible, fascinating to be able to look at them up close. Heading to the theatre entrance we’re handed programs and shown to our seats. 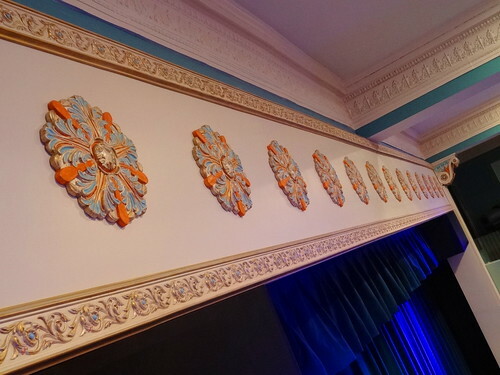 We’re sitting in the last row, we have a wonderful overall view of the space; decorative plaster has been restored, fancy medallions and highly detailed moldings surround the interior. 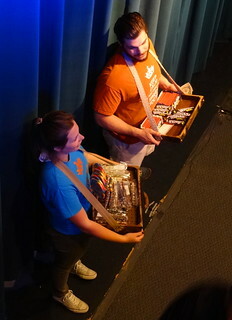 Two staff members from The Sweet Tooth hold old-fashioned cigarette-girl-type-boxes filled with Wonka bars on stage, patrons stand in line for Nestle Crunch, Reese’s and Cookies and Cream bars (wrapped in Wonka labels, of course) in hopes that they might be the lucky recipient of a ‘golden ticket’. Before the show starts winners raise their hand, they each receive a Sweet Tooth gift card. The lights dim and the show begins, Willy Wonka emerges from box seating, as he descends the staircase to the stage he sings Pure Imagination and our ride to the Wonka factory begins. 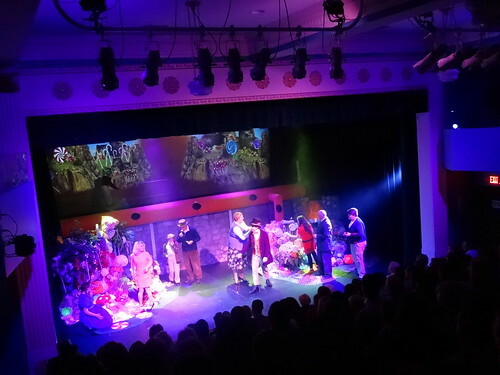 The sets are colorful, creative and downright fun, all of our favorite golden ticket winners are here, audience members can’t help sing along to songs ingrained in our memories– The Candy Man, I’ve got a Golden Ticket, I Want It Now, etc. Oh, I can’t forget the Oompa Loompas, elementary-aged children dressed in white overalls, orange-faced, wearing green wigs, singing and dancing—adorable. As all good stories go, they all lived happily ever after. In the wise words of Willy Wonka “If you want to view paradise, simply look around and view it. 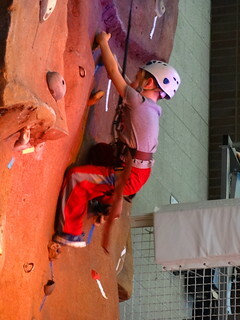 Anything you want to, do it.” Now get out there and have some fun! 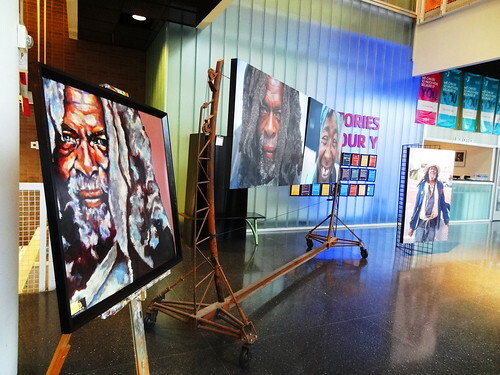 We’re in downtown Detroit today at the Boll Family YMCA for the Our Detroit photography exhibit; the show features 3 Detroit photographers: Amy Sacka, Bruce Giffin and Donita Simpson. We step into the light-drenched lobby, framed photographs, grouped by artist, temporarily hang on metal racks and wire partitions. 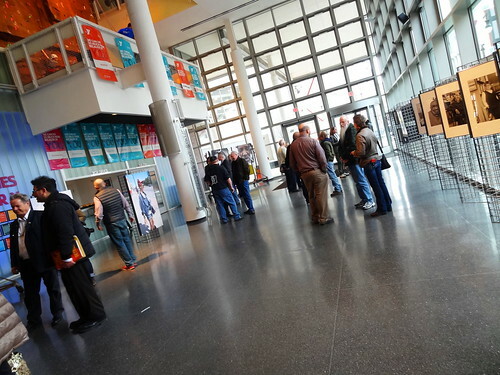 Curious visitors meander the space; the photographs, taken in Detroit, feature faces of everyday people who call the city home. Kris and I met Amy shortly after she moved back to Detroit, we truly admire her work, she really has a way of capturing the true essence of her subjects; it makes her pictures come to life. 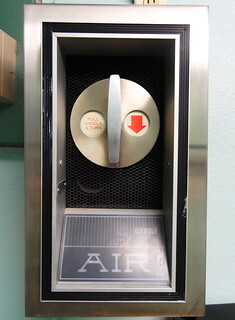 Each of the artists has their own unique style. The photos reach out to the viewer, making us pause to consider the subject, the surroundings, before moving on to the next. While we’re here we might as well check the place out. 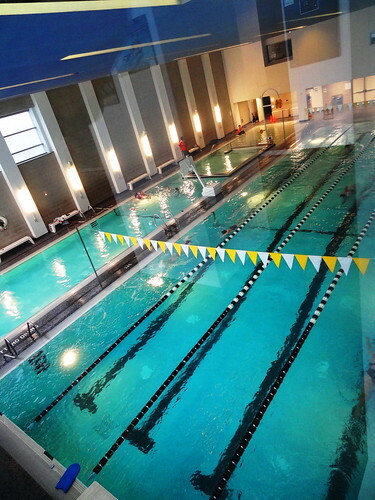 Walking to the far end of the main floor a large window affords us a look at the indoor pools, one for swimming, one for laps; bathing suit-clad members are having a good time splashing about. 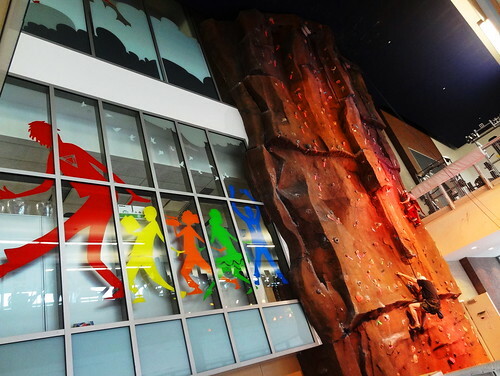 We take the stairway up to the top, a 40′ climbing wall with a seamless rock face has climbing routes for both the beginner and advanced climber; we watch as athletes young and old practice their skills. 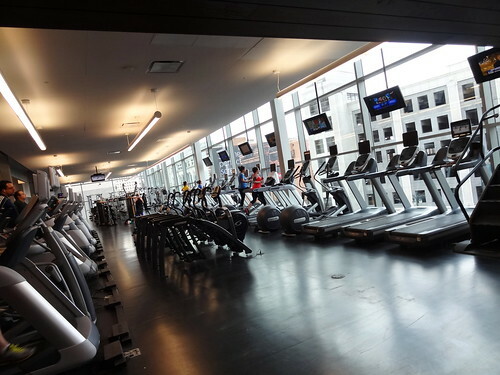 We take a peek in the conditioning room, floor to ceiling windows give people on treadmills and ellipticals a wonderful view of downtown. 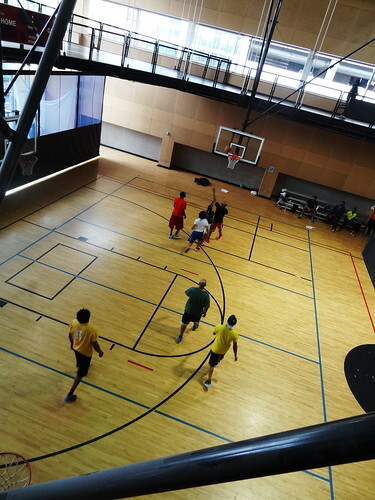 The indoor track makes us feel as if we are floating among surrounding buildings, a pick-up game of basketball is going on one side of the gym, a volleyball game on the other. 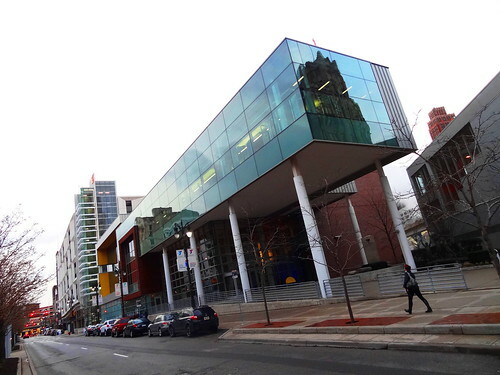 Much of the building is glass, making one feel connected to downtown, colorful artwork hangs on walls. 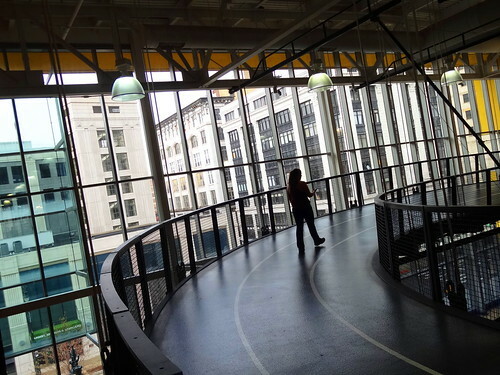 Renderings follow the Detroit YMCA from its beginning in 1887 on Grand River and Griswold to the 1909 building on Witherall and Adams to today’s Y. 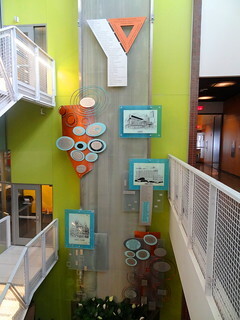 Prominent Detroit families like the Fords, Dodges, Kresges, Fishers and Hannans all supported the Y through the years. 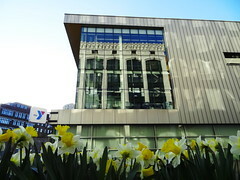 This building is named after philanthropists John A and Marlene L Boll, their foundation supports education, the arts and health services, all of which can be found here on Broadway. The evening is mild, we decide to walk the couple blocks to Vertical for dinner. Located below street level in the 1913 flatiron shaped building, originally the Henry Clay Hotel, then the Milner Hotel, now The Ashley, it’s home to 67 one and two bedroom apartments, Vertical wine bar and restaurant and the soon-to-open Dilla’s Delights donut shop. 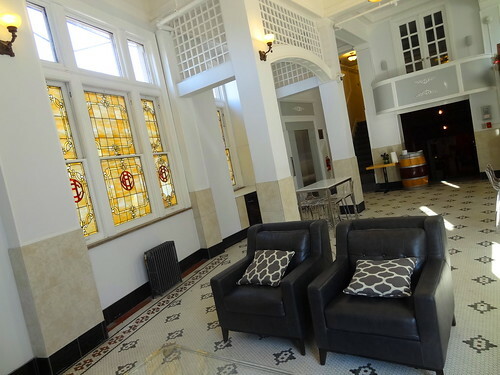 We enter on Centre Street, the lobby is quite lovely in white with black accents; some of the original stained glass windows remain as does the tile floor. 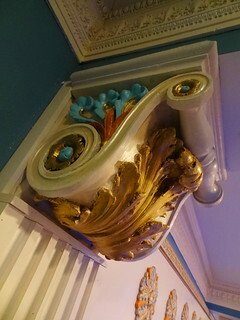 The restaurant is quite attractive, eclectic decor includes interesting chandeliers, partially restored tin ceiling, patterned soffets and bright red columns. Wine bottles are everywhere. 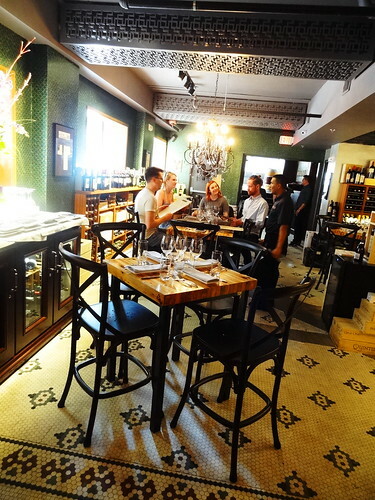 We are seated at a small table in the main dining area, the menu is filled with a variety of tasty appetizers, composed small plates, salads and desserts–the wine list is expansive….We each choose two items to share. 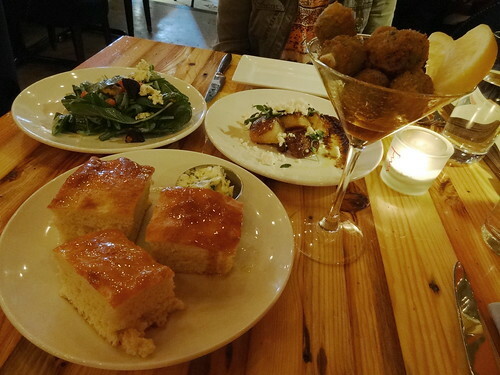 Flash-fried Spanish Queen olives are stuffed with Roquefort and served in a martini glass with curried honey, the focaccia of the day is a wonderful dense, tender bread brushed with chipotle honey and served with chive butter. The spinach salad is a combination of Mission fig, candied walnuts, tomato, red onion, Roquefort, tossed with a red-wine vinaigrette. The scallops (probably the most delicious we’ve ever had) are served with a corn coulis, bacon lardens, bacon powder, pea tendrils and a fig gastrique, this dish was exceptional. I have to say everything was excellent, flavorful and unique. 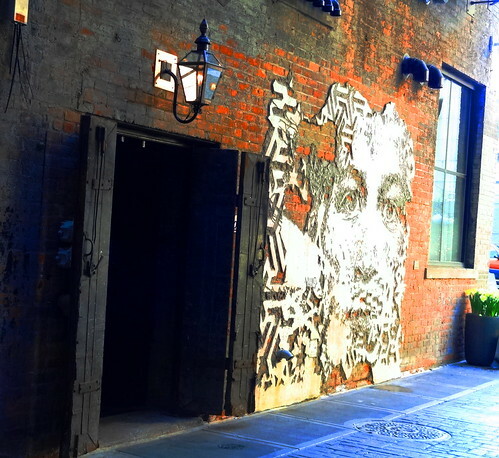 When we’ve finished we head out on foot again to a little hideaway in an alley. 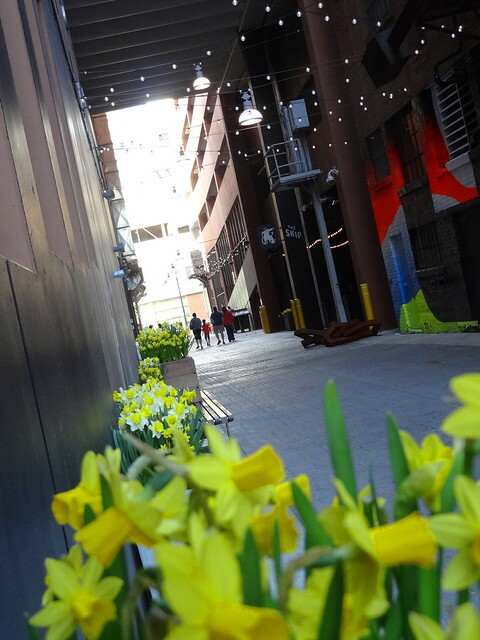 The Belt is the alley between Broadway and Library Street, linking Gratiot and Grand River. 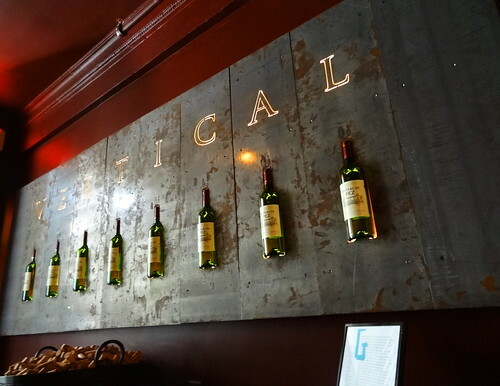 Home to fabulous public art including murals and installations, it’s also the only way to enter the newest craft cocktail bar Standby. Strings of lights criss-cross overhead, a lantern lights an open doorway cut into the brick wall, the entrance is through an old elevator shaft. Inside, the space is dimly lit, the decor clean and simple; dark wood, dark colors, soothing. 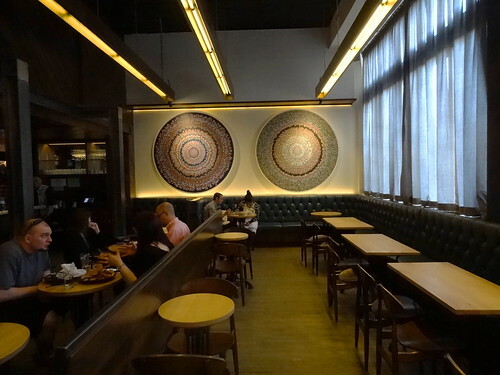 Two large, circular paintings hang on the left wall, small tables and blue banquette seating fill the room. 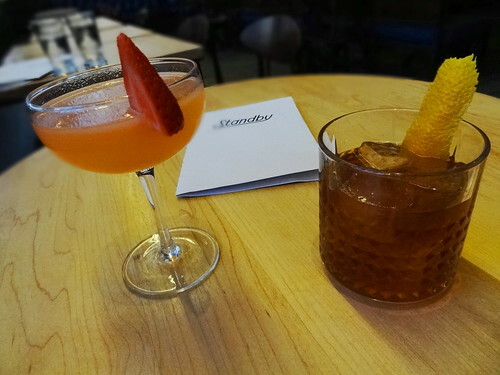 Earlier this month the Detroit Free Press named Standby one of the Top 10 Best New Restaurants in Metro Detroit, tonight we’re here for cocktails only. We are seated at a cozy corner table and given cocktail menus; drinks are organized by spirits; Gin, Whiskey, Rum, Beer, etc. 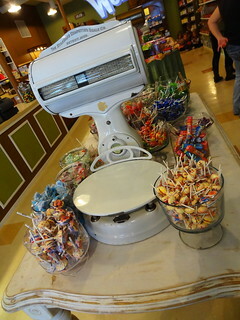 Ingredients for each drink are listed as well as flavor profiles–floral, tart, minty, woodsy, you get the idea. If you’re not sure, your server will help you out. Kris is having an Old Fashioned, I am giving The Last Straw a try; it’s, tart, botanical and fresh tasting—all the flavors I like. We sit back and relax as we enjoy our drinks in this (not so) secret (anymore) spot. The city is changing quickly. It’s hard to keep up with all of the new restaurants and bars opening their doors. 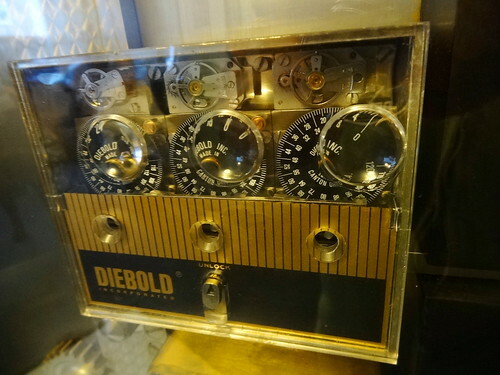 Detroit is an exciting place to be these days, c’mon down and be a part of it!